Geographical Range: Southwestern Mexico from Michoacan to the isthmus of Tehuantepec to Argentina. Diet in the Wild:Warm-blooded, Rodents and Lizards. 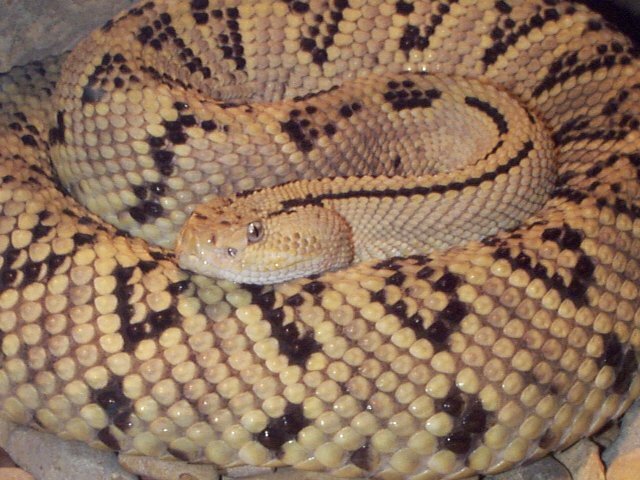 Physical Description: This snake is light gray with diamond patterns down the back. It is heavily bodied all over. It weights about 8 pounds and is 4ft long. This snake is called a rattle because of its rattle at the end of its snake. At birth snakes have a pre-button and everytime a snake sheds its skin, a new rattle is formed. after two or three sheddings the rattlesnake is able to produce the typical rattlesound.In the wild, the rattles are betweeen 8-11 segments because longer rattles get caught in between rocks and will break off. In captivity, the can have rattles with up to 20 segments because of the protected enviroment. Social Organisation: The Northwestern neotropical rattlesnake is a solitary animal. It spends most of its time alone; except during the mating season when it goes around in search of a mate. The Northwestern Neotropical rattlesnake is characterised by its large size, pronounced vertebral ridge , and a highly potentent venom. This rattlesnake delivers a large dose of venom through long, hollow fangs that fold back as the mouth is closed. When the snake strikes, the fangs fully extend, acting as two minature hypodermic needles. Typicaly, the pit viper possesses a a hemotoxic venom that damages the tissue area surrounging the bite area. This species venom contains a high pecent of neurotoxins that are generally associated with Elapds (Cobras, MAmbas, and Kraits) bites.This type of venom works primarily on the central nervous system in that it affects muscle control, respiration, and locomotion, and the sences. Symthoms may include mental incoherence, slurred speech, patial blindness, chills, numbness and tingling, vertigo, massive headaces abd difficulty in swallowing. The Northwestern Neotropical rattlesnake usually hunts at night using the infrared sensors located in the pit between its eyes and its nostrial to locate prey, hence the name Pit Viper. These pits are so sensitive as to detect a singe degree variatiion in temperature making warm blooded animals an easy target. The size and venom toxicity of this species makes it a formidable predator, and is considered a threat to man. 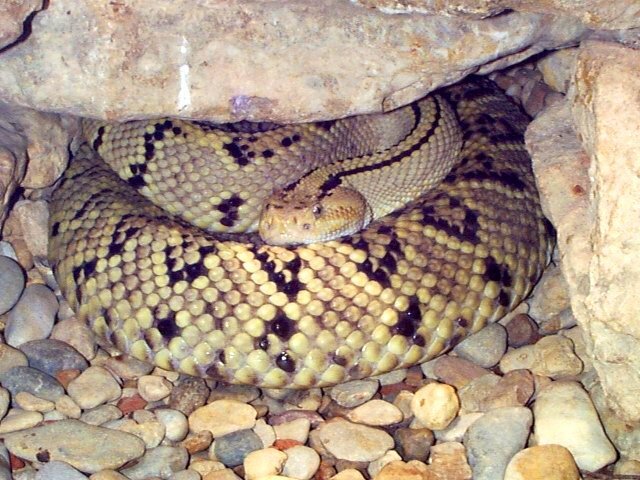 Northwestern Neotropical rattlesnakes are viviparous, giving birth to live young. Young snakes are born after a gestation period of 4-6 months and are able to take care of themselves as soon as thet are born; while eggs with an incubation period of 2-3 months are more vulnerable. An average litter consisits of 5-10 young. Young rattlesnake are between 15-35cm long at birth and can deliver a painful bite the day they are born. They are sexually mature after 3 years. The longetivity in nature and in captivity is estimated to be between 12- 25 years. The Northwestern neotropical rattlesnake is a sit and wait predator so it spends most of its time curled up in an elert position. It sometimes moves under or stays close to the rocks that hedges its home in the herpetarium. 1.Fort Worth Zoo Infomational Palcard. 2. Interview with Andrew Brinker. Zoo Attendant at the Fort Worth Zoo Herpetarium.